Investigators were trying to learn more about Adam Lanza and questioned his older brother, who was not believed to have been involved in the rampage at Sandy Hook Elementary. 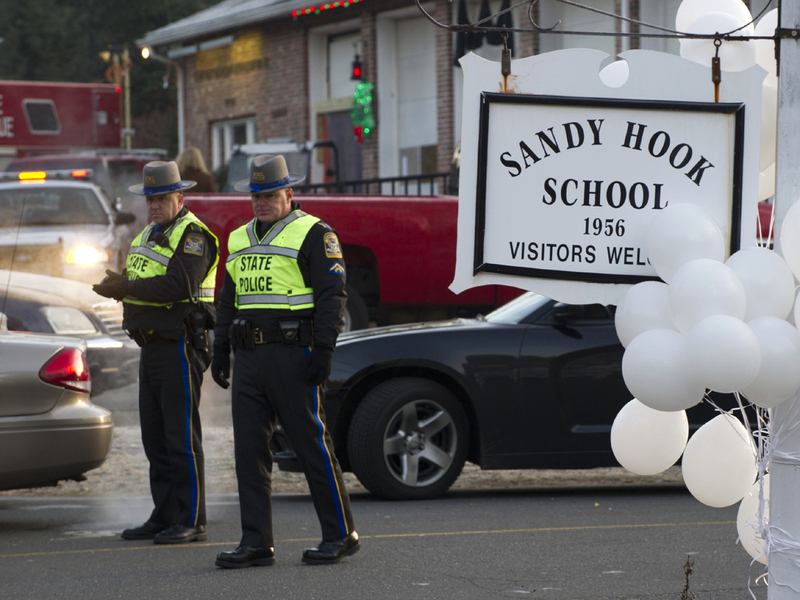 Police shed no light on the motive for the second-deadliest school shooting in U.S. history. A law enforcement source told CBS News that Adam Lanza had three weapons with him during the attack: Two handguns (a Sig Sauer and a Glock), and a Bushmaster .223 assault rifle; spent shells were found in the school. Those three weapons were registered to his mother. There was also a fourth weapon (a long gun) found in the car he drove to the school. In addition, the source told CBS News there were "a few" other weapons found at the mother's house. The registry of the weapon in the car and at the house are still be checked. The tracing of all the weapons - such as where and when they were purchased - is still being conducted. The Associated Press reports a Henry repeating rifle, an Enfield rifle and a shotgun were recovered. It was not clear exactly where those weapons were found. Lanza's aunt said her nephew was raised by kind, nurturing parents who would not have hesitated to seek mental help for him if he needed it. Marsha Lanza, of Crystal Lake, Ill., said she was close with Adam Lanza's mother, Nancy, and sent her a message on Facebook on Friday morning asking how she was doing. Nancy Lanza never responded. Marsha Lanza described Nancy Lanza as a good mother and kind-hearted. If her son had needed counseling, "Nancy wasn't one to deny reality," she told The Associated Press late Friday. Marsha Lanza said her husband saw Adam as recently as June and recalled nothing out of the ordinary about him. A nurse who had been with the school for 15 years, told CBS News' Scott Pelley that no one knows Nancy Lanza and that she was not a staff teacher, after earlier reports said Nancy Lanza worked at the school. The nurse said its conceivable that Nancy Lanza was a subsitute that she never met, but very unlikely. No other staff member the nurse has talked to has ever heard of Nancy Lanza. The nurse also knows of no connection between the shooter and the school. Asked at a news conference whether Lanza had left any emails or other writings that might explain the rampage, state police Lt. Paul Vance said investigators had found "very good evidence" and hoped it would answer questions about the gunman's motives. Vance would not elaborate. Officals also said that the suspect forced his way into the school; he was not let in voluntarily. Shooting witness: Kids said "I can't go back to that school"
"People in my neighborhood are feeling guilty about it being Christmas. They are taking down decorations," said Jeannie Pasacreta, a psychologist who volunteered her services and was advising parents struggling with how to talk to their children. Maryann Jacob, a clerk in the school library, was in there with 18 fourth-graders when they heard a commotion and gunfire outside the room. She had the youngsters crawl into a storage room, and they locked the door and barricaded it with a file cabinet. There happened to be materials for coloring, "so we set them up with paper and crayons." "One of them slid his badge under the door, and they called and said, `It's OK, it's the police,"' she said. The gunman forced his way into the kindergarten-through-fourth-grade school, authorities said. He took three guns into the school -- a Glock and a Sig Sauer, both semiautomatic pistols, and a .223-caliber Bushmaster rifle, according to an official who was not authorized to discuss information with reporters and spoke on the condition of anonymity. The weapons were registered to his slain mother. "Nancy wasn't one to deny reality," Marsha Lanza said, adding her husband had seen Adam as recently as June and recalled nothing out of the ordinary. Catherine Urso, of Newtown, said her college-age son knew the killer. "He just said he was very thin, very remote and was one of the goths," she said. "We would hang out, and he was a good kid. He was smart," Joshua Milas said. "He was probably one of the smartest kids I know. He was probably a genius." "It has to stop, these senseless deaths," said Frank DeAngelis, principal of Colorado's Columbine High School, where a massacre in 1999 killed 15 people. In Washington, the Coalition to Stop Gun Violence organized a vigil at the White House, with some protesters chanting, "Today IS the day" to take steps to curb gun violence. In New York's Times Square, a few dozen people held tea lights in plastic cups, with one woman holding a sign that read: "Take a moment and candle to remember the victims of the Newtown shooting." "The majority of those who died were children -- beautiful little kids between the ages of 5 and 10 years old," Obama said at a White House news briefing. He paused for several seconds to keep his composure as he teared up and wiped an eye. Nearby, two aides cried and held hands. Australian Prime Minister Julia Gillard described the attack as a "senseless and incomprehensible act of evil." "Like President Obama and his fellow Americans, our hearts too are broken," Gillard said in a statement. In Newtown, Robert Licata said his 6-year-old son was in class when the gunman burst in and shot the teacher. "That's when my son grabbed a bunch of his friends and ran out the door," he said. "He was very brave. He waited for his friends." "I told them we had to be absolutely quiet. Because I was just so afraid if he did come in, then he would hear us and just start shooting the door. I said we have to be absolutely quiet. And I said there are bad guys out there now and we need to wait for the good guys to come get us out," Roig told ABC. "If they started crying, I would take their face and say, `It's going to be OK. Show me your smile,"' she said. "They said, `We want to go home for Christmas. Yes, yeah. I just want to hug my mom.' Things like that, that were just heartbreaking."